The Iowa State Patrol has released the name of the woman who was killed in a wrong-way collision on the Avenue of the Saints south of Mason City on Monday. The Patrol says 78-year-old Darlene Keifer of Greene was killed in the accident which happened shortly after 11:30 a.m. at the 190 mile marker on U.S. Highway 18. The patrol says the car driven by Keifer was traveling eastbound in the westbound lanes of the divided highway and collided with a van driven by 54-year-old Blaine Freeman of Elk Run Heights, Iowa. Keifer died in the accident while Freeman was taken to Mercy Medical Center-North Iowa with what were described as minor injuries. There was a chain-reaction accident earlier Monday, on another stretch of Highway 18, in northwest Iowa. 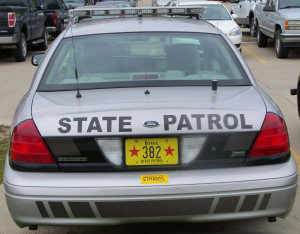 The Highway Patrol reports failed to slow down or stop as he approached a group of vehicles that were stopped for road construction on the east edge of Sanborn. Authorities say a total of six vehicles were involved in the wreck, which is still under investigation.